For those who know me personally know what a struggle it was getting pickle to sleep in his own bed. From day 1 he was a cuddler. I also had first time mom worry wart syndrome after he was born when he kept gagging on phlegm. Apparently that is normal for newborns. I didn’t know that until we had our daughter this year. I made the mistake of letting our son sleep on me every single night. When we moved in with my parents it was a struggle between, “you need to get him in his own bed” and “why is he crying.” By time he was 3, he was still mostly sleeping in our bed. When we got pregnant with our daughter I knew we really had to get him in his own bed. After all, my belly was going to get larger and I needed all the space I could get. There were nights he slept on our floor, but now that he is 4 he sleeps in his bed 90% of the time. He still comes in our bed once Chris leaves for work in the morning, most days. When little miss Poppy was born I knew I had to be different this time. I knew I didn’t want the struggle of sharing our bed for another 3+ years. I was better this time around, but getting lazy is easy. Especially when you are running on very little sleep, cosleeping doesn’t seem so terrible. I needed it to function during the day. Poppy spent time in her bassinet for the first 2 to 3 months. I would say time was about 50/50 between the bassinet and cosleeping with me. Around her turning 3 months old I really wanted to focus on getting her to sleep in her bed and putting herself to sleep. We switched from the bassinet to the pack n play. Once again, my zombie like tendencies made it easy for me to be lazy and put her back in bed with me. My lack of sleep does not make me the most pleasant person to be around. I get easily angered. It was just easier on everyone if I got sleep, even if that meant she was in bed with me. Then the guilt started in. Pickle didn’t understand why he couldn’t sleep in our bed, but Poppy could. He was right. Not only that, but my body is still healing from the birth and it is hard to get comfortable on 4 inches of space. At 6 months old I packed up her pack and play and decided it was time to get her to sleep in her bed in her own room. Eliminating the ease of the pack and play in our room forced us to use her crib in her room. 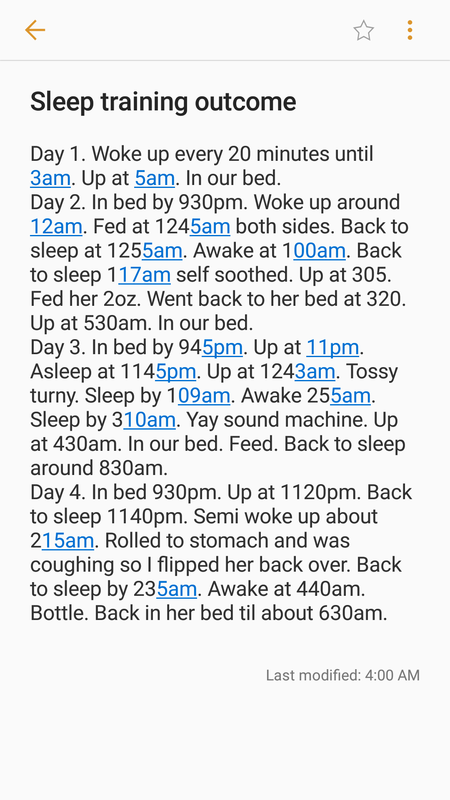 I kept a log of the first 4 nights. I don’t know if she wakes up because she wants to comfort nurse or if she just misses me. I’m sure it is a combination of both. I read somewhere that babies should sleep through the night by 6 months old. Poppy does not. It is part of the mission. Instead of automatically feeding her we have been trying other ways to comfort her back to sleep that way she is not waking up to feed. Luckily, she has been rather successful at not needing to eat in the middle of the night. My children have never been the best sleepers, though. I think they get that from me. Pickle can sleep for 6 hours and act like he has slept 14 hours. The recommended amount of hours of sleep for kids apparently doesn’t apply to mine. Poppy is lucky to take an hour nap, twice a day. It has been 13 days since we started transitioning her into her room. Tonight she slept from about 9pm to 10pm, 1016pm to 1115pm, 1125pm to 1215am, 1230am and is still currently sleeping at 4am. One of her longest stretches yet! I can see the progress being made, but I have had to “suffer” along the way. I know myself. I know that if I go to sleep it will not be long before I hear her crying. I know that if I try to sleep and get woken up abruptly, I will lack the patience that is needed in order to make this successful. My choice then is to stay awake until she hits her longest stretch for the night. Which, up until about 2 nights ago was 330am. Now my body is use to being up all hours of the night again. So here I am 410am, still awake. Unfortunately, I do have to be awake at 630am. I am hopeful that she will continue to get better each night. I am hopeful that, at some point, I will have “normal” sleeping pattern myself. All things are a work in progress. I suppose I really should check my eyelids now. Hahaha made me laugh a lot but very true! My son & his wife are going through the same process with their 15-month old daughter. Good luck!